There's a new pan in town (the Zwilling Madura Plus Nonstick)—and it passed this editor's take-home test. I used one pan through college. It was $11 and had a wobbly handle, but it got me through more eggs-for-dinner dinners and 9-inch stir-frys than I can count. I threw it away, scratched and weird after a melty plastic spatula incident, when I graduated, and moved to Brooklyn where I now borrow my roommate's lovable but wobbly-handled $11 pan. 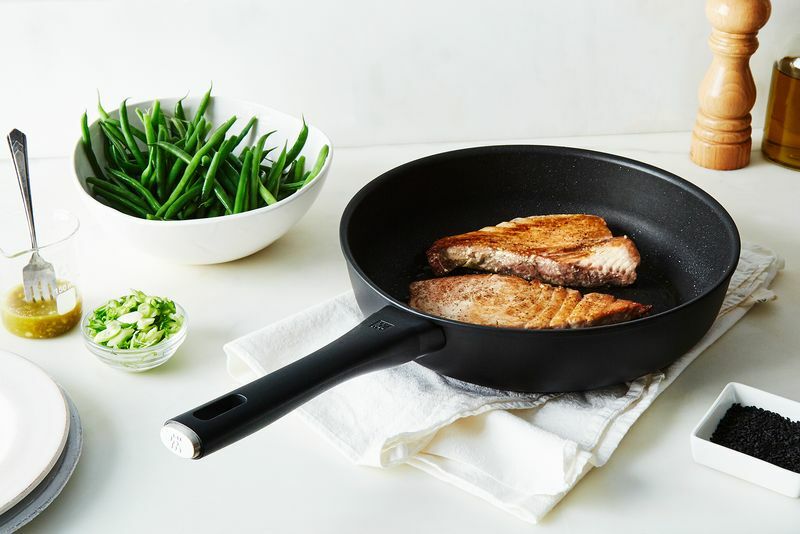 Needless to say, I was very happy to oblige when our Shop team asked me to take home Zwilling's newest pan, the Madura Nonstick Plus Fry Pan—which is exclusively available in our Shop for the next two weeks—for a test run before they decided to sell it. Left, the egg-in-a-hole fries up; right, nary a trace left in the pan post-fry. Unlike with some nonstick pans, the butter began to brown while my egg cooked; and when it was time to flip my egg-in-a-hole—which sometimes requires some crossing of fingers and holding of breath—I just slid the spatula under it and, you know, flipped it. Easy. It was clear right away that, even on my very slanted stovetop, everything had cooked evenly thanks to the pan’s heaviness and even heat. The pan barely looked like it had been used, without a trace of egg (or even, it seemed, butter) residue. Same pan, different stove. Metal tongs not pictured. On Sunday night, I was slated to visit my friends John and Deirdre for Sunday dinner. I had to test a recipe in addition to the pan, so I loaded everything—the pan and a gallon baggie of marinated green beans—into my purse and walked the 15 minutes to their house. “I have to do this for work,” I told them as I lit the burner on their stove. Like mine, theirs is a gas stove, which was just fine because this pan works equally as well on electric and induction stovetops. You can even put it in the oven (up to 300° F), like a cast iron skillet. The pan heated up quickly, and I poured the green beans into it, tossing them with John and Deirdre’s metal tongs. Thanks to four layers of extra-durable nonstick coating, metal utensils won’t scratch the pan. This is good for a number of reasons: no need for “please: no metal utensils” notes stuck above the stove (I am admittedly guilty of this), and you can tote a pan to your friends’ house for dinner and not have to worry about whether they’ll have the appropriate cooking spatula or tongs to use with it. Peaches caramelizing in the early morning light. Bleary-eyed, I rolled out of bed knowing it was time for the pan’s third trial, its second breakfast. I had a heap of the season’s last peaches going south fast, so I set my mind to a quick batch of caramelized peaches. I put the pan over medium-high heat and when it was quite hot, I added sliced peaches, a drizzle of maple syrup, and a little salt. Caramelization can also be tricky in a nonstick pan, but the syrup bubbled up immediately and the peaches started to take on color. I spooned them warm over yogurt—a very good Monday morning breakfast. And the pan cleaned up almost immediately, the post-caramelization sugar crust needing barely any scrubbing. All I had to do was wipe it out with a sponge. First photo by Bobbi Lin; all others by the author, who is not a photographer. Thank you for the well written article, Caroline. I must tell you that your photograph (third from top) of the green beans in the black pan on the steely burner of a stove wowed me. Made me want to dash out and buy fresh green beans--to pan fry on my 14-year-old, good-as-new stainless steel skillet! We all learn by trying new things when the opportunity arises.. I bought this pan some time ago and I use it every day. I wash it in the dishwasher but I do not use metal utensils (in any of my pots or pans). It is as perfect as it was on day one. I love it so much I may even start hand washing it. The one thing I do not ask that pan to do is searing a steak and finishing it in a 500 degree oven. I don't think it likes very high temperatures. Got this on Dec. 22, 2015 as a Christmas gift to myself and I liked it a lot. used it for scrambled eggs, browning ground meat, sauteing vegetables, and even took the handle off and put it in the oven under the broiler for steak on two separate occasions with no issue. Right away, I noticed a small bubble in the nonstick coating of the pan before I even used it, and I ignored it, thinking it was just part of the texture of the coating. Now, after washing it in the sink today, I see that bubble burst made a chip in the coating. I did use metal utensils on it quite a bit, because I totally bought into the hype... how stupid of me. Looks like I'm going to have to throw this pan out after maybe only a couple dozen or so uses. I have a 11" large nonstick deep skillet/fry pan from Calphalon that my mom got me at Walmart in 2014 that's still going stronger than this, and it made no crazy guarantees, but nonstick only lasts so long, so I guess after I also say good bye to the Calphalon, I'm gonna stick with cast iron and stainless steel, I have a great double-bottomed stainless cookware set that's been rocking in my kitchen since 2012. I use either a pizza stone or baking steel for pizza. I have stainless steel and cast iron for almost everything else. I do have 2 Scanpan nonstick pans. They have held up very well for around 2 years now. Does this mean using aluminum foil is bad too? Do people feel that for the price of these pans it is worth it? or can I go to Walmart or Bed Bath and beyond and plunk down 20 bucks for a good nonstick pan and get similar results? People may laugh their asses off but my Rachel Ray pan set from my sweet next-door neighbor does the same exact thing described in this review. It does read like a commercial but perhaps that is just the brevity of the article. Hit the selling points, test it out on a few items and move on. I purchased the entire set recently and so truthfully have not made a mess of anything as yet. I cook basically 9 nights a week so it'll be used and abused for sure at my house. Egg-white omelets for my oldest daughter, cheesy scramble w/ fried rice and tofu for my youngest, stir-fried leftovers for me and some form of fried egg thing-of-sorts for the wife. Let's see, that's just Sunday and/or Wednesday nights. Then we'll slow-fry tofu, make perogies, some curry disaster for a co-worker and maybe a grilled cheese or ten. That's a week. Will update if I notice the pan scratching or the handle falling off, etc. My family has some serious many-generations long Henckels' products still around so that's a good test of time for me. Hello. Yes, I still like them. They are the daily "go to" for virtually everything. Still cooking the egg-white omelets my daughters eat before most things. I even talked my mom into getting a set when she sells her current house and moves into the new one. Sure, there are a few "odd" things about them - the various, tiny "nicks" in the coating but considering they get used more than any other skillet or pan in my arsenal I'd say I'm delighted with them. Lower-than-usual heat to keep things grilling - even whip up a wicked roasted corn w/ chipotle mayo for my oldest daughter who can basically eat the entire bag of Publix Organic corn by herself when prepared this way. That was a horrible and fragmented sentence but I think you get the picture. I don't want to be too critical but this article really reads like a commercial. I'm not sure your tests "wow" me much at all. A fried egg with butter is hardly a test. An omelette without butter -- now that's a feat. My All-Clad non-stick is safe up to 500 degrees. And while you say that the pan is ok with metal utensils, I see that you used wooden ones. Yes, would love to know how this compares to other safe, nonstick, oven safe & dishwash safe pan. Can Food52 conduct a comparison test? Thank you! Zwilling states it is PFOA free on their site but makes no mention of it being PFTE free. Can Food 52 confirm whether or not it is PFTE free? Thanks! hi soly, the pan is not PFTE free. thank you for checking! Aluminum for induction...really. Upon checking this apparently is magnetic stainless wrapped around aluminum core. No magentic no work. The question is how well does it work on induction fair good great ? Depends a lot on metal type and construction. Pleased to learn. It only survives 300F oven heat? My cast iron is much hardier. Yes, that's not much higher than "Keep Warm." Hmmm how would these compare to Swiss Diamond's non stick pans? Price is good but I'm iffy on the water based lacquer and the coating wearing off in time. Gotta say, After reading, I was hoping it would be $11. transferred into the food......you may want to try it, but I'm not. Sharlene, I agree with you about aluminum being very bad for one's health. If it accumulates in the brain, it leads to Alzheimer's Disease. I will not buy a slice of pizza in a pizzeria for several reasons.....one of the reasons is that the pie is on an aluminum pan. I look at the pan with the deep scratches in it and I cringe. In reference to pots and pans, I mostly use stainless steel, but I would like to use a nonstick pan occasionally. All the nonstick pans I've seen are aluminum. What pans do you recommend? Thank you in advance for your help. I can highly recommend the Allclad stainless steel nonstick pan, pricey but good.